(11 minute read) To put a stop to our cravings and hunger, we often eat on the go. Seeking anything that will stop our stomachs from rumbling, we don’t pay too much attention to what we inhale, except for the taste. We don’t seem to care about the high price we are paying, the price for convenience. Even though we are ‘filling up’ on a daily basis on fast and junk foods, foods laden with harmful proteins, toxins, preservatives, and synthetic dyes, we are starving our brains. We are causing both our brains to be malnourished. Yes, we have two brains in our bodies, a gut brain and a head brain. In order to understand how to feed our bodies and brains the correct nutrients, we must first gain an understanding of how our two brains integrate with one another. The first brain is the one most people are aware of, that gray matter behind our eyes and between our ears. For a long time, we assumed neurotransmitters were created there, along with neurons, but recent research has found the existence of a second brain, the one in the gut. Michael D. Gershon, M.D.,the father of this brain gut concept called neurogastroenterology and chairman of the Department of Anatomy and Cell Biology at New York–Presbyterian Hospital/Columbia University Medical Center goes into much more detail in his book The Second Brain. He explains, believe it or not, the guts is where the majority of neurotransmitters like dopamine, serotonin, acetylcholine, and gaba are created, based on the foods we eat. In fact, we create more neurotransmitters in the gut brain than in the head brain. Neurotransmitters are messenger molecules, created from the synergy of our DNA and the foods we eat. For our brains to function properly, these must remain in balance. 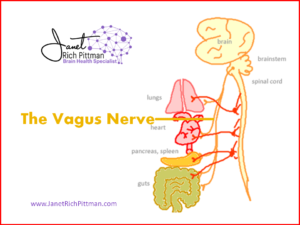 Stemming from the vagus nerve, neurotransmitters travel and branch out throughout the digestive system, throughout the body, and up to the head brain. In other words, what happens in vagus doesn’t stay in vagus in this case! If you really think about it, you are probably quite aware of the physical connection between your head brain and your gut brain. Maybe you’ve been faced with the challenge of a presentation or performance, and your stage fright manifests with a tightening gut, difficulty concentrating, breaking out in a sweat, or trembling. People with a really bad case of nerves might find themselves nauseous or unable to eat. If that worry builds over days, it can result in constipation, diarrhea, or even a hives breakout. This is because the head brain and the gut brain are intertwined; what affects one affects the other. 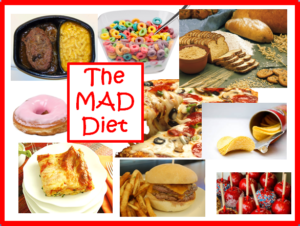 The trouble is that most of us have eaten the Modern American Diet (MAD) or Standard American Diet (SAD) for our entire lives. We don’t need just a presentation to make our ‘brains’ not function properly, it’s the food we are eating. The stuff we stuff into our mouths is too often laced with toxins (aluminum, fluoride, pesticides, and even arsenic); preservatives; bleached sugar; excess gluten; genetically modified grains; and hydrogenated oils, and none of these things are good for us. First, because we eat too much sugar, the brain quits producing insulin. (Our head brain as well as our pancreas creates insulin. Insulin is the hormone we create to get nutrients into our cells.) When the brain quits producing insulin, the neuronal supportive cells become insulin dependent and nutrients cannot get into these cells. When nutrients cannot penetrate the brain cells, they consequently shrivel and die. This leads to diabetes Type III, otherwise known as diabetes of the brain. 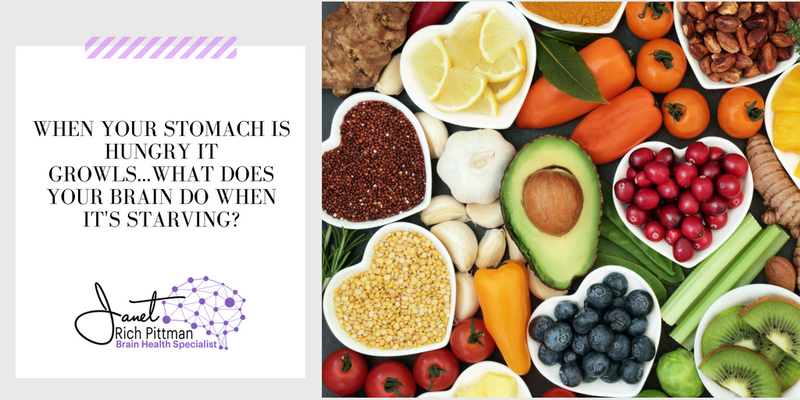 When we eat these MAD foods for a period of weeks, months, years to decades, we destroy the gut lining and produce severely weak transmitters. If the neurotransmitters produced in the gut brain are off kilter, they will cause an imbalance in the head brain as well, robbing our energy and negatively influencing our mood, emotion and cognition. The distorted or crippled neurotransmitters do not effectively communicate with other body systems causing improper creation and function of the hormones that aid in digestion, sleep, and even our sexual lives. Think of this communication as your state of health. Poor brain-bodily communication is the second wave of damage caused by the food we eat. With this destroyed gut lining or leaky gut, we send the immune system into overdrive. This is the third wave of brain trouble called hyper inflammation, where the good, healthy cells are gobbled up right along with the weak, damaged ones. This hyper inflammation happens in the head brain as well, leading to the production of damaged cells that will not perform properly in the body, thus inviting disease, disease which range the gamut, from cancer to dementia and all before or in-between. 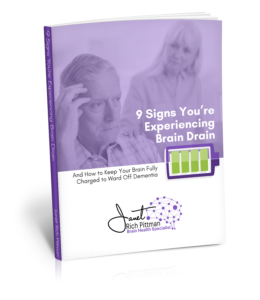 To learn more on how these so-called foods damage your brain and what brain foods to eat, subscribe and read: 9 Signs You Are Experiencing Brain Drain and How to Keep Your Brain Fully Charged to Avoid Dementia. Click Here. On the whole, we are guilty of malnourishing ourselves and starving and sickening our brains and bodies. It starts with brain fog, no inertia, constant fatigue, insomnia, mood disorders, memory problems, and trouble focusing and leads to diabetes, depression, Crohn’s disease, thyroid issues, and a medley of other horrible conditions, including cancer. In fact, science can now feasibly trace Alzheimer’s and other dementia, like Parkinson’s and Lou Gehrig’s disease (ALS), to initial problems in the gut. Dr. Mark Hyman, a family physician and a medical director at the Cleveland Clinic, presented research and theories of fourteen MDs, PhDs, and specialists from around the U.S. in an education program I recently attended on the brain/gut connection. After describing this immense problem, the prescribing conclusion was the same from all the speakers: for better health, clean up your gut. Surely, we must change the way we eat, and I am working on a booklet to help you to do just that. It is my hope that it will help you understand what foods to avoid and why and what foods you can enjoy for better brain and body health. Sugar, it is more addictive than cocaine. Let’s get off this deadly drug. First, say no to candy bars and other hard candies as well as high fructose corn syrup. If you have to have sugar, opt for honey, molassas or maple syrup…they are all natural with no preservatives or additional chemicals. But even these natural sugars in excess can be bad. If you must quench your sweet tooth, grab a piece of fruit. Remove gluten from your diet. That’s a protein in all wheat products that not only damages our intestines by opening them up (leaky gut) but opens the door to hyper inflammation. No bread? It is super hard to do, I know from experience. Breakfast: substitute oatmeal, eggs, bacon, sausage for your cereal. For lunch, let’s work on a decrease of your sandwich bread. For one week go to just one slice of bread, i.e. have a fold over or open face sandwich. Work to eating no sandwich bread at all concentrating on the meat(protein), veggies and fruit. When you are faced with hamburgers and hot dogs, just don’t eat the bread, eat two meats instead and load up the lettuce, pickle and tomato. Avoid all processed foods. Gluten is added as a filler and emulsifier. Better yet, eliminate all wheat from your diet for two weeks. At the end of the second week, down a loaf of French bread or have a huge bowl of pasta. In an hour, analyze how you feel. Say NO to fake food colorings in your foods. Many unnatural dyes have been banned in Europe and Australia due to the brain damage they cause. For more on this read one of my articles We Are Dying Our Brains, found here. Investigate paleo (all natural foods) and/or ketogenic (low to no simple carbs, moderate proteins, all natural good fats) eating. Helping you keep your memory, enjoy good brain health, and age successfully, I look forward to communicating with you soon!